Today we’ve picked for the review a wine from the famous Georgios Lafazanis Winery – Sirius White 2016. This is a white wine blend, made of malagousia and assyrtiko – two greek exquisite grape varieties – where the first one adds the citrusy-mineral accents, while the later one is responsible for the sweet-floral aromatics. The wine itself comes from the Southern Greece wine region, namely Nemea and Boeotia, which has a hot mediterranean climate, thus resulting in quite aromatic wines, mostly characterized by deeply floral and exotic fruits flavours, but enough theory, let’s move on to the tasting. Pastel green color, very clear and transparent, with ivory hues towards the rim of the glass. The nose is strong, filled mostly with citrus and exotic fruits flavours: pineapple, lime, apricot, figs, sweet lemon, ripe yellow pear, white apple, elderflower, acacia, potpourri and some nuanced hints of daisies. The wine is medium-dry, with moderate alcohol level, medium acidity and smooth tannin. It feels floral and citrusy-tropical, s this is a very aromatic wine indeed. The wine tastes crisp, fresh and a bit opulent, with a quite lean and smooth accent and a fair overall balance. It has a medium finish and a balanced, zesty and citrusy aftertaste. 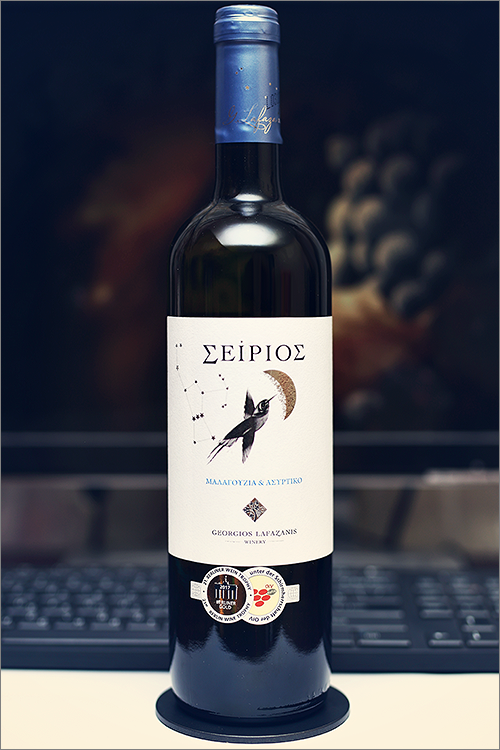 This is definitely a great Wine of Greece and the overall rating says the same, with 90.0 points scored it is right there, among the best wines we’ve tasted so far. Please click on the chart icon on the left in order to get to the wine rating page, where you can find all the wines we’ve tasted to date. Conclusion: this is a wine that is definitely in its prime form – ready to drink now and not worth any additional bottle ageing. It feels a bit wide, but floral and tropical, with a nuanced citrusy accent. Our recommendation would be to go with some mint & melon summer salad or a cherry tomato & cantaloupe salad, as the latter one is simply amazing. Enjoy!